Rajasthan Sports Council had organised state-level sports during Rajasthan Diwas 2008 at Sawai Man Singh Stadium in Jaipur. 40 students from Tilak Bal Gurukul, Jaipur participated and took active part in the event. It was a great moment in their lives as these students are participating in the state-level sports. The students were thrilled to see the colourful arrangements made by the organisers. Thousands of students from different parts of the state thronged to the stadium to show their sportive skills. Hip Hip Hurray.........14 students from TBG won prizes by participating in various events. This is a real achievement for us, expressed the teachers of TBG. The parents and villagers of Langadiyawas and Nonpura felt very happy with this achievement. The students were filled with happiness and joy. It was like winning world cup for us, expressed Suman Meena. 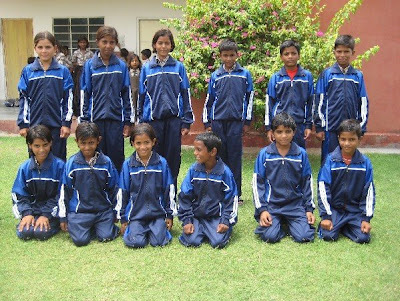 To felicitate and honour the winning students, SMK, RRC and IDF organised an event and presented special track-suits for them. The felicitation function was organised on 8th June at RRC, Jaipur. Mr. M.L. Gupta, Chief Engineer of Jaipur Electricity Board was the Chief Guest. Rotarian K.K.C. Shah, Rotarian (Dr) S. B. Thapar and Mr. Atul Sharm joined in felicitating the students. The dignitaries congratulated the students on their winning prizes in state-level sports. Mr. Suresh Kaul, President, Sarthak Manav Kushthashram appreciated the students' participation and congratulated the TBG team for motivitating students in sports activities. 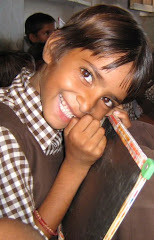 Tilak Bal Gurukul is an empowerment school of IDF run in Langadiyawas and Nonpura villages in Jaipur, Rajasthan. SMK team monitors the activities. Dr. A.R.K. Pillai in his congratulatory message said, the students of TBG are the real jewels. DNA newspaper in Mumbai carried the following report on 20th June 08. IDF thank Mr. T.K. Unnikrishnan for the special interview. Also our sincere gratitude to the DNA team for their kind and continued support to the humanitarian programmes of IDF. ARK Pillai is a happy and satisfied man now. He is the President of The Indian Leprosy Foundation (ILF) presently renamed as the Indian Development Foundation (IDF) headquartered in Goregaon west, which is celebrating its Silver Jubilee Year of useful existence in the country and secondly Pillai himself has turned 80 this year and is hail and hearty. Pillai came to Mumbai as any other malyalee hunting for a livelihood. The first job he got was that of a clerk in the Central Railways. And with his hard work and quest to learn more, he could complete his MA, LLB and even a Phd. When Pillai got a plum job in a private ad agency and was living luxuriously, he started feeling mentally guilty as he saw many others living in utter poverty. “The luxurious life style made me feel sick in my mind. I quit my high-paying ad agency job to start ILF in 1983. I actually got attracted to the announcement made by former Prime Minister Indira Gandhi in the United Nations that leprosy will be eradicated from the country in the year 2000 under the 20 point programme,” explained Pillai as to how he got interested in helping leprosy patients of the country. Pillai collected Rs 720 from his well wishers to start ILF which has now a corpus fund of over Rs1 crore. Recently the IDF received donations of 500 pounds from Polesworth International Language College of UK and 700 US dollars from St. Pius School of US. 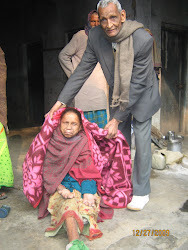 “ILF became IDF in 2005 as the leprosy elimination programme bore fruit and the number of leprosy patients of the country shrunk to about 60,000 from 40 lakh in 1982,” says Dr Narayan B Iyer, National Cordinator of IDF. “IDF aims at rural development making available basic education, health and development facilities through their Project Goodness Programme,” adds Iyer. IDF has 15 Gurukuls (schools) and 100 associate leprosy hospitals and projects to take their goal to the masses. IDF has recently joined WHO’s ‘Stop TB Partnership’ working for creating awareness and making available counselling and medicines free to the needy patients. 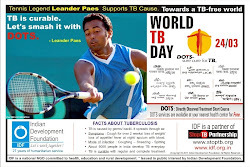 Explaining the urgent need to rope in NGOs and private practitioners into TB Control Programme, IDF Trustee Secretary C N N Nair said, “Rough estimates show that there are about 14 million TB cases in India and about 1000 patients die of TB everyday. The annual loss to the exchequer is roughly Rs 12,000 crore.” Nair added,“TB is completely curable and the medicines are available free from the government run hospitals.”. With generous support flowing from philanthropic persons and organisations, Pillai is sure that IDF would definitely live up to the expectations and would become a role model to the country’s NGOs. Heard of BR Hills ? How can BR hills fullfil one with joy ? It sounds strange but the reality is worth experi encing. The Biligiriranga Hills, (Kannada:ಬಿಳಿಗಿರಿರಂಗನ ಬೆಟ್ಟ ) commonly called B R Hills, is a hill range situated in south-eastern Karnataka, at its border with Tamil Nadu. BR Hills is 90 Kms from Mysore and 180 Kms from Bangalore. Vivekananda Gir ijana Kalyana Kendra (VGKK ) a tribal development project of Dr.H. Sudarshan is situated in BR Hills. Dr. S. Franklin, Area Manager, IDF-Karnataka led a social team comprising Master Karan Dravid, Mr. Srinivas Nandagopal, Mr. Sai Prem Kumar, Mr. Ravi, Mr. Vijay Kumar Das, Ms. Chandrika, Ms. Hema Das and Mr. Bakiaraj to VGKK unit at BR Hills on 12th June 08. IDF partners with VGKK and runs an empowerment school in the tribal belt. Recently under Karan Program 2k8, IDF had also donated computers for the children the IDF Gurukul. The visiting team were all praise for the excellent work of Dr.Sudarshan for the uplift of Soliga tribes. The team distributed books to the students in Vivekananda Bal Gurukul and interacted with the students for class 10. The team also visited the neighbouring hamlets and talked to the people. VGKK is one of the pet projects of Karan and he loves visiting BR Hills to teach the children the basics of English. IDF Social Ambassadors Meet was held on 15th June 2008 at IDF office, Mumbai. Dr.Pillai welcomed the team and appreciated the good work carried out by the team in the national interest. Dr. CNN Nair congratulated the budding ambassadors for taking initiatives in social service. Ambassadors exchanged their views and ideas for better participation and providing support to the society. They felt networking with other NGOs will really help in reaching out the poor and the needy. The team also touched upon teachers' empowerment and youth empowerment programmes in various colleges. Involving groups from NSS and NCC will strengthen the ongoing social programmes of IDF, the team expressed. Those present in the meeting included :- Dr. Geetha Mohan, Mr. R. Mohan, Mrs. Rajalakshmi Radhakrishnan, Mr. Abraham Samuel (Bahrain), Mr. Karthick Sridhar, Ms. Debanita Biswas, Mr. Amit Sharma, Mr. Navratanmal Kothari, Ms. Pooja Terwad, Dr. Srinidhi Ravi, Ms. Meenakshi Iyer, Dr. Sharad Nayampally. Ms. Sneha Sharma, Mr. Nandakumar Marar and Mrs. S.N. Iyer. Dr. Narayan B. Iyer explained about IDF Project Goodness programmes and felt confident of spreading the message of goodness to the unseen with the help of IDF ambassadors. Deepak and Riaz felt happy welcoming the IDF team to their institution. Keeping their project-work aside, the students went on preparing a colourful powerpoint presentation welcoming the team. Indian Development Foundation team visited The Bombay Institution of Deaf & Mutes (BIDM) on 12th June 08. Founded in 1885, BIDM which is located in Mazagaon is one of the oldest hearing-impaired institutions in the country. The institution had taken the challenge of educating the hearing-impaired children by giving them a fresh perception in life. With a total of 163 students during the current year, BIDM is one of the projects of IDF. A couple of sponsorship programmes of BIDM is being supported by IDF. IDF team comprising Dr.A.R.K. Pillai, Dr. Narayan B. Iyer, Dr.Sharad Nayampally and Mrs. Debanita Biswas met the BIDM team Mr. Tyronne Concessio, Mrs. Jennifer Alexander, Mrs. Mary Sahayarani and Mrs. Pradnya Bhole and discussed on various social responsibility programmes. The visiting team propos ed for the IB School students taking up CAS activities in BIDM. Mrs. Jennifer Alexander, Co-ordinator of BIDM welcomed the suggestions and appreciated the support given by IDF. The visiting team were taken to the Computer Lab where the special students demonstrated their talents in IT. Though there were initial communication hiccups between the visitors and the students, but understanding each other and learning newer things sent the message of goodness in the silent valley. With the help of the IB students through their CAS activities, IDF intends reaching out the BIDM students and building a better career for them. Better networking with other NGOs can help in avoiding duplication of work and reaching out more needy people. Be optimistic in your approach as India is on the path of progress and development, expressed Mr.Vishwavir Ahuja, Managing Director & CEO - India, Bank of America. IDF team comprising Dr.A.R.K. Pillai, Dr. Narayan B. Iyer, Dr. Sharad Nayampally and Mr.Hari Thampy called on Mr.Vishwavir Ahuja on 12th June 08 to express gratitude for the support extended by the Bank of America for the ongoing projects of the Foundation. We from Indian Development Foundation would like to record our thanks for s upporting a couple of programmes of IDF, said Dr.Pillai. We are on the path of empowering the have-nots in the society, he said. Mr. Vishwavir Ahuja congratulated Indian Development Foundation for the wonderful social projects carried and wished its team good luck in humanitarian activities. IDF Ambassador Master Karan Dravid is seen presenting a IDF donation to Northwick Girls Higher Secondary School, Royappuram, Chennai. Dr. Pillai inducts Mr. Shailesh Saraf as IDF's Social Ambassador. Highly qualified at a very young age, Shailesh has keen interest in serving people in distress. IDF welcomes Shailesh Saraf as Social Ambassador. 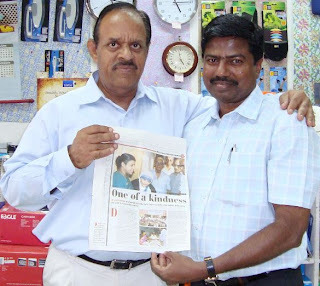 Mr. Atmaram, Proprietor of Gangaram's Book Bureau, one of the leading book stalls in Bangalore, receives a press-clipping from Dr.S.Franklin, Area Manager, IDF-Karnataka. Mr. Atmaram has been a great supporter of IDF for several years. 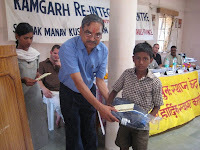 IDF thank Gangaram's team for participating in social responsibility programmes. The Teachers' Empowerment Programme conducted by Indian Development Foundation (IDF) at Bal Vikas Vidyalaya, Talegaon needs to be replicated in many schools, observed Mrs. Helen Anthony, Principal of the school. IDF, a national N GO based in Mumbai, arran ged a Teachers' Empowerment Programme at Talegaon on Saturday the 7th June 2008 where about 50 teachers from three schools connected to Snehavardhak Shaikshanik Trusts participated. The main faculties for the empowerment programme included Dr. Geetha Mohan, Principal, Usha Pravin Gandhi College of Management, Mrs. Rajalakshmi Radhakrishnan, National Awardee a nd Education Consultant and M rs. Shobha Sankaranarayanan, Faculty, Business Administration, B. D. Somani International School. Important topics in the main session covered teachers' role in education, excellence in students' performance, child psychology, multiple intelligence and behavioural management of classrooms and allied subjects. Dr. Geeta Mohan, Mrs. Rajalakshmi Radhakrishnan and Mrs. Shobha Sankaranarayanan felt happy that they could participate in the knowledge sharing exercise and empower the teachers towards better performance. Topics like teachers' social responsibility, know your personality and tips on yoga and fine living were dealt by Dr. A. R. K. Pillai, President of IDF, Dr. Narayan B. Iyer, National Coordinator and Dr. Sharad Nayampally, I DF Ambassador. IDF is a leading national NGO committed to on health, education for the poor and needy and rural development. IDF has a track record of 25 years of humanitarian service. IDF aims to reach more teachers and students and empower them for better performance. The empowerment programmes conducted by IDF are on a voluntary basis in national interest. The teachers expressed their happiness as their received valuable information on teaching techniques. We will be able to perform bette r in our profession and produce talents in Talegaon, expressed the teachers. Earlier Dr. Chandrakant Shete, Chairman and Shri Yeshwant Kadam, Secretary of the School welcomed IDF team while the Mrs. Kiran Vaishnav and Mrs. Deepali Deshpande, headmistress of the school expressed their thanks for empowering Bal Vikas teachers. IDF team also included Mr. Hari Thampy, Mrs. Debanita Biswas, Mr. Sanjay Waghmare, Mr. Jitendra Kothari and Mrs. S.N. Iyer who took active part in co-ordinating the event. The teachers' empowerment programme concluded by singing Pasayadan, the nine ending verses from Dnyaaneshwari. The Times of India, Chennai edition covered the story of Karan meeting the Tamil Cinestar Surya. IDF thank the Times of India team for their kind and continued support. Chennai : Rattling off a list of his favourite cartoons (Perman, Ninja Hattori, Shaun the Sheep), eight-year-old Karan Dravid seems like every other child his age. However, the desire to help those less fortunate than him has made Karan an inspiration to his peers and even landed him a meeting with popular Tamil actor Suriya on Wednesday. “I had a lot of fun. He asked me how, at my age, I thought I could help underprivileged children. Actually, I became interested in this sort of work when volunteers from the Indian Development Foundation (IDF) made a presentation at my school about persons living with leprosy. After I became a member of the organisation, we were taken to B R Hills where I saw how tribal children lived. I came back to school and made an appeal to the students to donate old clothes,” Karan said. Starting from here, he became responsible for Hewlett Packard providing 30 used computers to IDF after he had made an appeal in the Bangalore edition of TOI to IT firms to donate their old machines. “I visited Papad village in Rajasthan where I met children who had never seen a mirror before. When I came back, we arranged to send them computers, a few geometry boxes and mirrors,” Karan recounted. It was his father Sai Premkumar, who introduced Karan to the every day struggles faced by underprivileged families. “He is an inspiration to his classmates. They want to learn something from him. I think when there is an interaction from one child to another, it makes a lot of difference,” Premkumar said. Appointed the youngest brand ambassador of IDF, actor Suriya wished Karan the very best of luck, C Chidambaram, Southern Regional Manager, IDF, said. “He told Karan never to forget the work he has done so far and to keep going,” Chidambaram added. It is nothing to do with Mahabharatha. Though the personalities met for a mission, but with social vision. 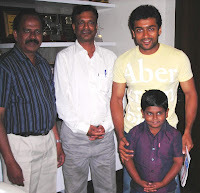 The youngest social ambassador of IDF, Karan Dravid called on Tamil cinestar Surya at his residence in Chennai on 4th June. Surya was all praise for the excellent work done by young Karan in the social field. Associating with an NGO at a very young age is really a matter of inspiration for the yout h in the country, expressed Surya. 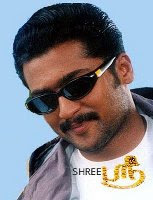 Surya congratulated Karan and IDF team for inculcating social values in schools and colleges. 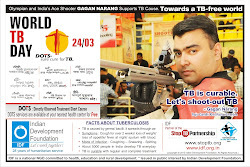 Surya, who promoted TB awareness programme through REACH organisation in Chennai said, IDF's role in TB awareness programme will certainly help the society. Impressed by the work of Karan in mobilising computers from the corporates for IDF Gurukuls, Surya exhorted the people to support Karan in his social programmes. Earlier, young Karan apprised the activities of IDF and presented literatures to Surya. A volley of social questions were exchanged between Karan and Surya during the meeting. Karan congratulated Surya for his involvement in social programmes. Karan also wished him best of luck for his future film assignme nts. Mr. C.Chidambaram, Manager-SR, IDF and Mr.Sai Prem Kumar, Karan's father were present during the meeting. Loksatta, a leading International Marathi news daily from Indian Express Group, gave an excellent feature of Dr.A.R.K. Pillai, founder President of Indian Development Foundation (formerly Indian Leprosy Foundation) on 2nd June 2008, which happened to be his 80th Birthday. We thank Loksatta team for the kind and continued support to our national humanitarian programmes. Click LOKSATTA to read the report in pdf format.